The Fallguy MINI MP3 module (Article No.0031) is an universal and compact credit card sized embedded module for playing compressed audio files (MP3). 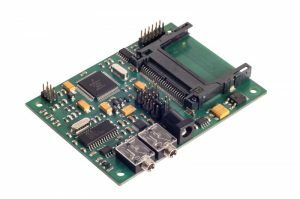 The module has been specially developed for use in embedded systems and for integration in customer-specific environments. It is particularly characterized by its use in harsh industrial environmental conditions. The module has a Compact Flash (CF) card slot for accepting Type I or II CF cards. The module is controlled by buttons and analog inputs. Depending on customer’s requirements, the internal firmware of the module is adapted to the application-specific requirements. The playing behavior of the module is determined by the firmware used. 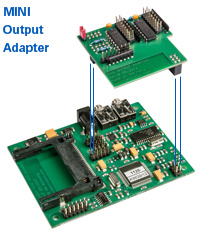 The MINI Output adapter (Article No.0151) extends the MINI MP3 module by 16 outputs for direct control of up to e.g. 16 LEDs!